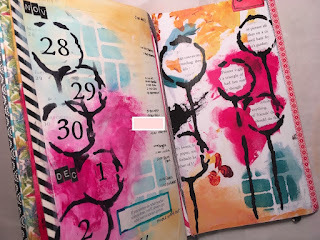 My 2016 art journaling focused mainly on two art journals: my weekly planner and bi-weekly Inspiration Wednesday fabric journal from Donna Downey. This last spread sums up the year with hidden written notes from my father, who passed in 2016, and journal notes from my Mom, who was an artist. I added collaged pieces from my recent visit to NYC to see The Nutcracker with my daughter. It brings the journey to a close beautifully. Do what makes you happy! 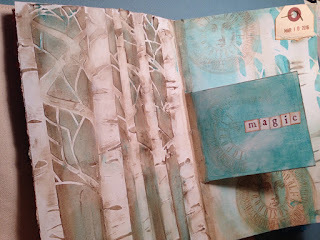 Color, molding paste, stencils and stamps make my soul sing! What about yours? 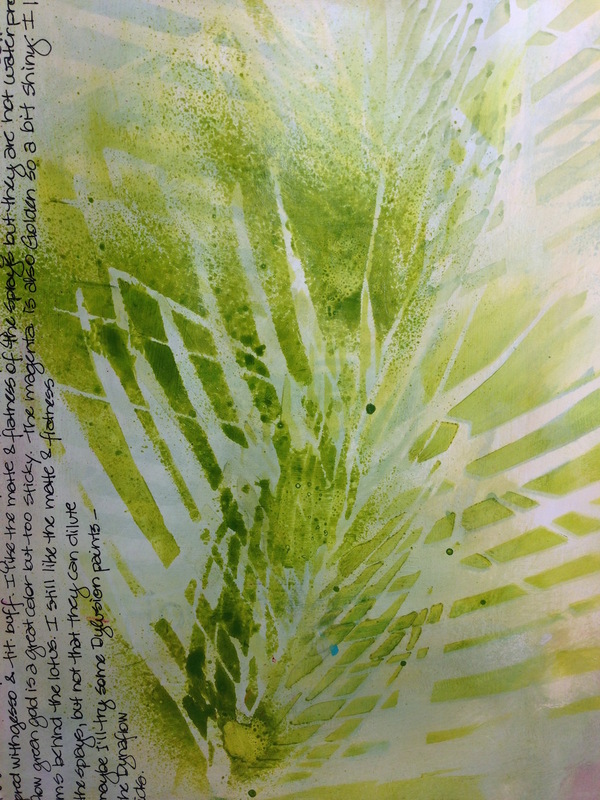 I use deli paper between my pages, as a palette and to clean off stencils. This makes a yummy layer of color on the sheets. Deli paper is thin so a simple glue stick will put it in place. 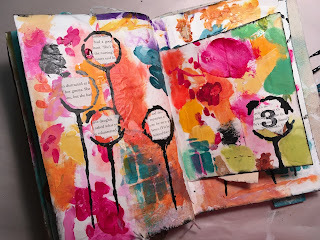 After I covered my pages with leftover deli paper, I stenciled a bold Donna Downey image and then glued pieces of torn book text. It’s fun to see the random words that pop up when you do this! Pick up the newsprint or scrap paper keeping your table clean and see what you can do with it! 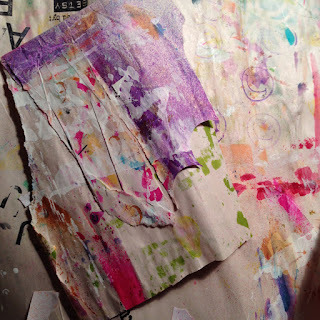 Don’t forget my favorite trick of making color copies of your pages to use as collage paper in other pieces. I made a copy to put in my planner to document the pages I created this week. Have fun! 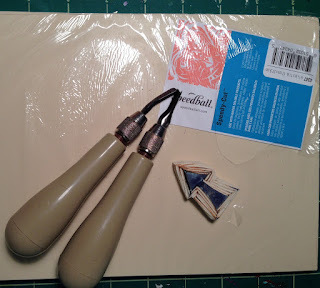 I had some fun hand-carving stamps today using a Speedball Speedy-cut sheet. I cut some simple shapes, but also found a picture of a feather and transferred it into the eraser. As I created this page, my thoughts were supporting North Dakota and the great USA overall. 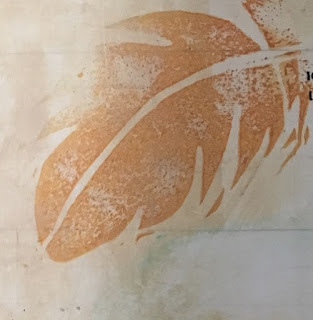 Samples of my stamps are shown, with a close-up of my carved feather. Voices whisper in the trees, "Tonight is Halloween!" Dynaflow inks, tree stencil, black acrylic paint, Micron pen. The windswept tree stencil from Stencilgirl.com caught my eye and so I wanted to try a few possibilities. 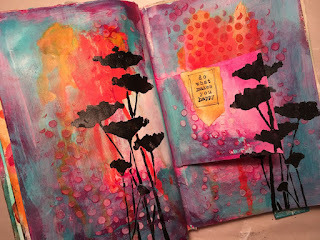 I made several experiments with alcohol inks, paint and distress ink in my journal. 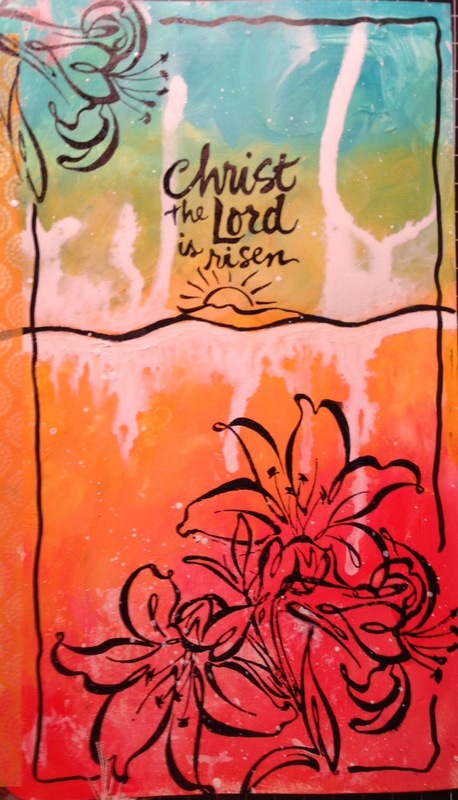 I have two final pieces to share-- I made the colorful one on canvas with Dylusions paint over collage text. 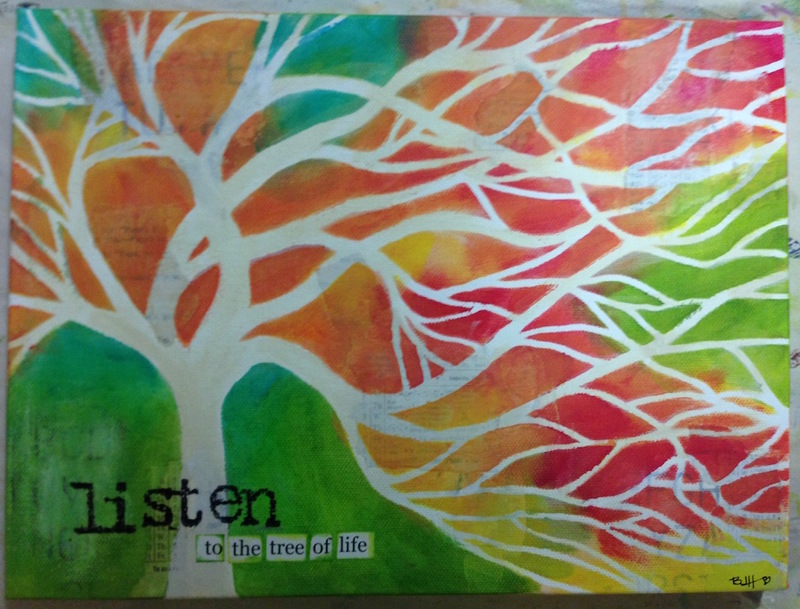 You'll see the messages hidden within the tree. This was a gift for my friend, Mary Cameron. 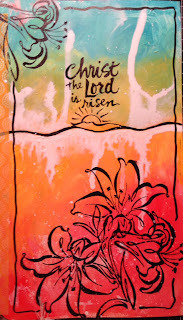 I also wanted to show the stencil with a positive design (as opposed to the negative stencil). 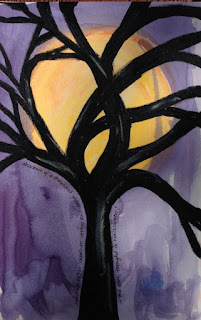 I sprayed the background with Dye-na-flow inks and then traced the stencil before painting the tree. 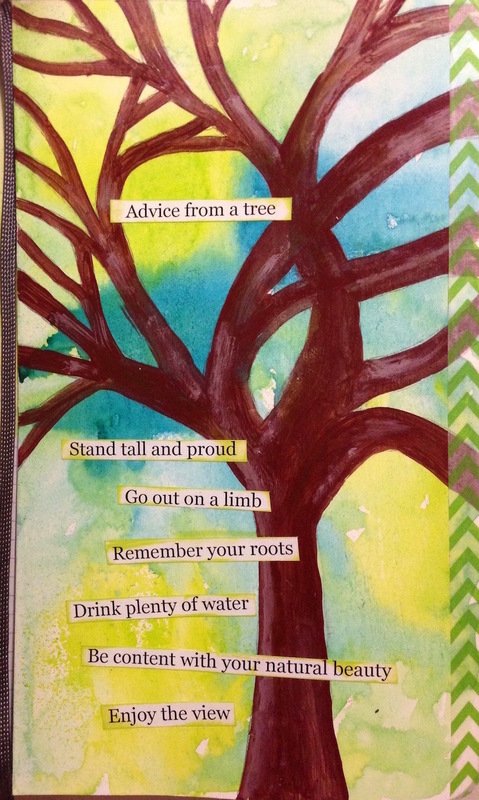 I used one of my favorite tree quotes as typed text strips. You can see that cropping the stencil works well for a vertical orientation, too. 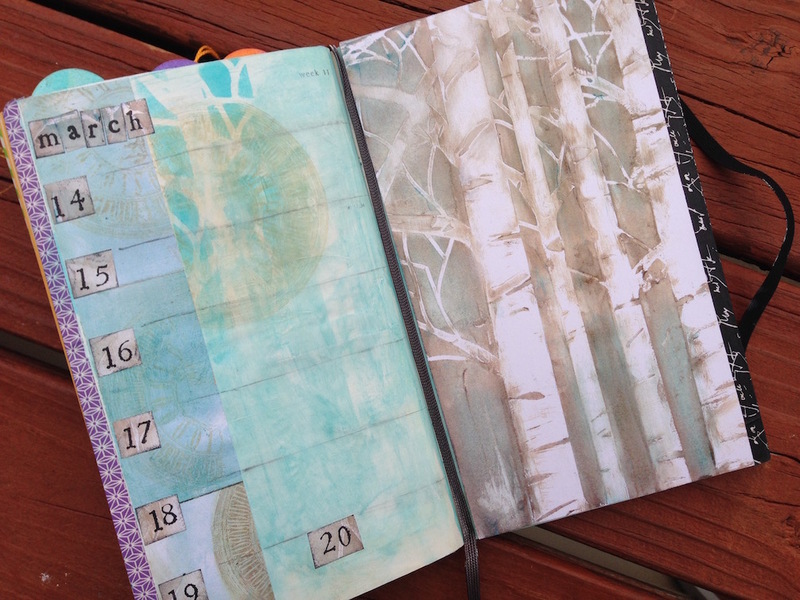 The end of summer always reminds me of how much I love of being in nature, so I'm hanging on by creating pages about the trees I find so comforting. Since we never seem to "have time to create art", I wanted to create something simple. The DLP prompt for the week was to add a border. I used a page that already had color on the background as a start, but wasn't finished. 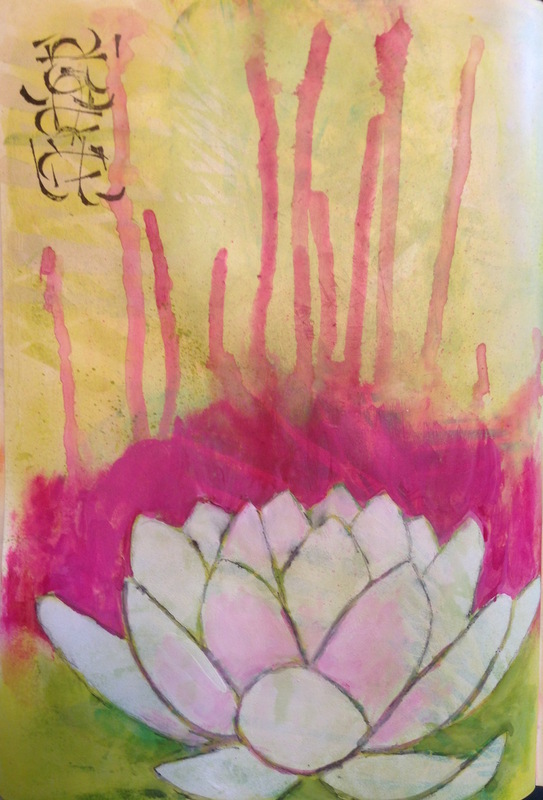 I decided to stamp the flower image in bright pink, but it lacked something. 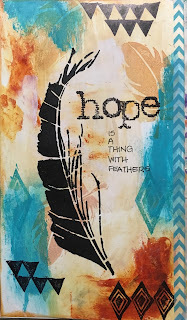 So I painted it with water and then stamped over top with black along with the quote in black. (Stamps are by Donna Downey) The border was created by sponging brown ink through a textured ribbon. 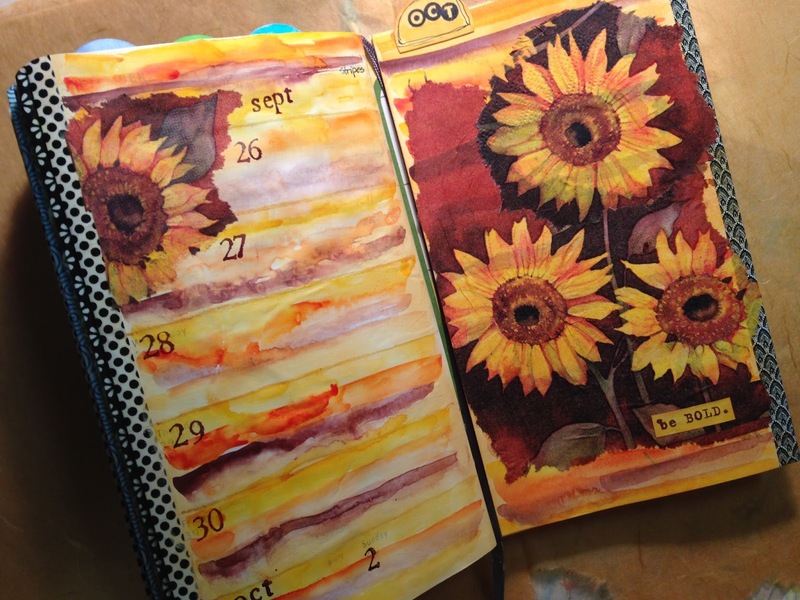 You'll see wash tape on the left where I added the page to my journal. Try something simple, it's very stress-free! 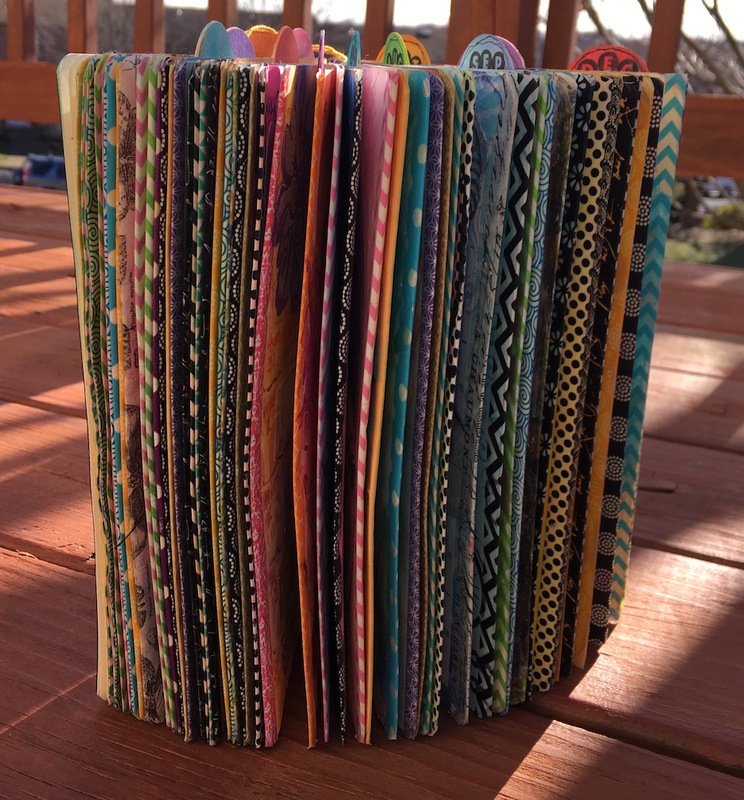 Try using that stash of wrapping paper! Inspired by Donna Downey's Inspirational Wednesday, I went to my favorite summer theme -- the ocean and beach. I can't live without them. 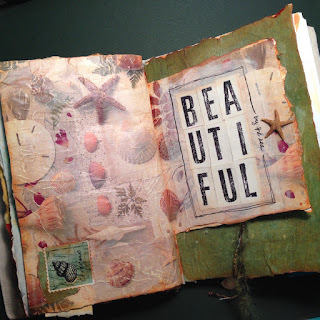 And yes, that's a real starfish on the right page! What calls to you this time of year? 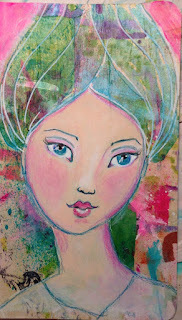 I have been experimenting with faces inspired by Jane Davenport's classes and book. Also inspired by the latest DLP prompt to use your under paper, I combined the two by gluing down the under paper and then using paint and colored pencils on top. The surface, of course, was not smooth, but that kept things interesting! I like how the colors and textures add wonderful unexpected surprises. 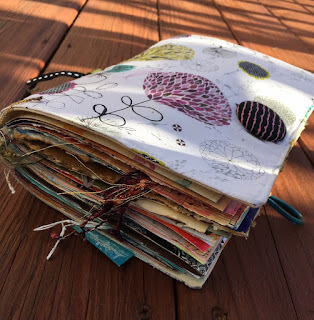 I keep a journal to honor my mother who passed away 10 years ago. 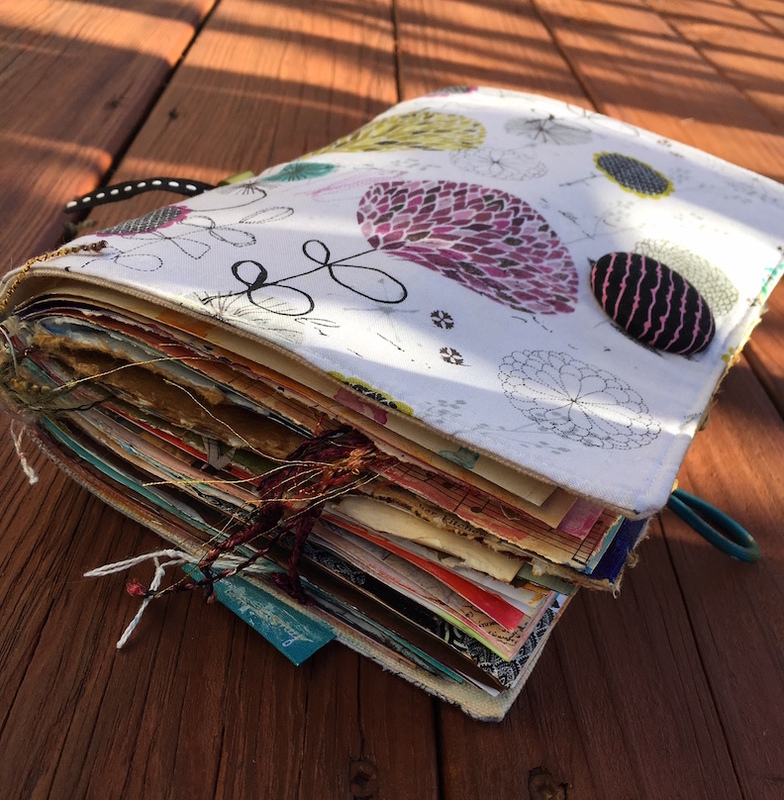 This journal is not shared with anyone as it's a way for me to vent, talk to my mom and honor her and the things she loved. Here's a rare look at this week's entry for my mother, the gardener. Happy Mother's Day! I have been experimenting with a new palm stencil from stencilgirl.com. I actually cut off the edges of the stencil frame so I could use it more freely. 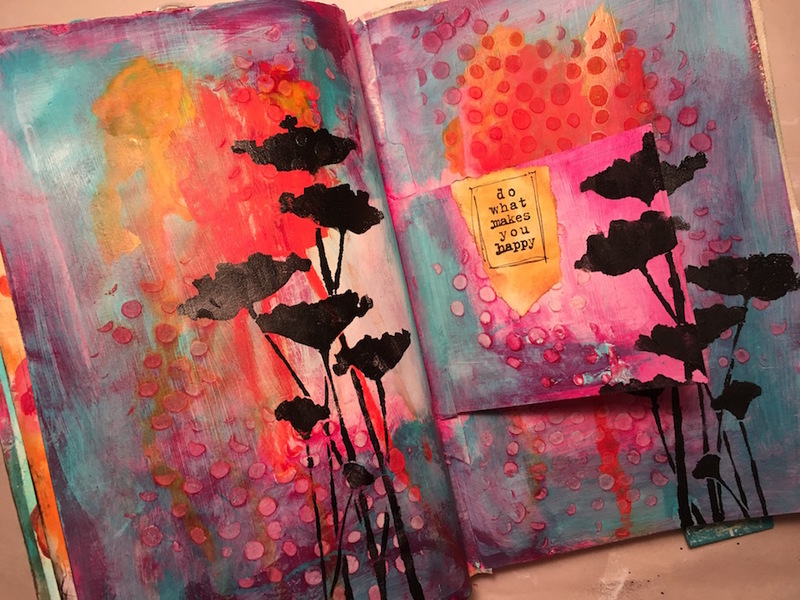 One of the pages didn't work out as is, but covered up with titanium buff, a white gesso lotus and magenta drips transformed the page into this lovely zen image. Love when those "mistakes" happen and give us an opportunity to create something better, don't you? 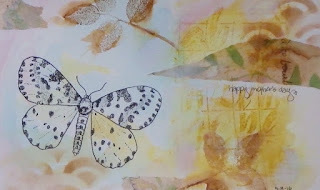 I often create something and then run off to the copy store to make color copies in all sizes to reuse in other artwork. My latest creation is from a prompt for Inspiration Wednesday by Donna Downey. I won't share the process but you can join in the fun here. 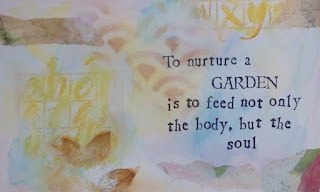 I recently purchased light modeling paste and TCW aspen tree stencil so these became the focus for my inspiration. 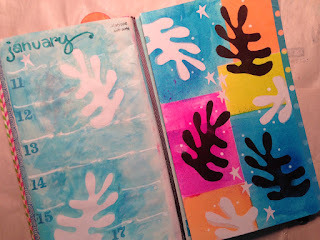 When I buy a new stencil, I try it out in my idea journal. Next I try different techniques in my experimenting journal. Note: be patient and let the modeling paste dry before adding glaze colors! After experimenting I felt ready to start the IW pages-- using the modeling paste on left and glaze on the right. I keep a notebook of favorite quotes by subject so I pulled out one I wanted about "magic" because the trees reminded me of a magical forest. 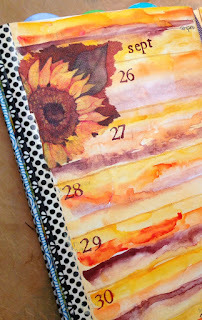 I started my March page of DLP by incorporating a favorite magazine clipping. I pulled out this lovely nest image I saved for inspiration. I first glued pages from the Farmer's Almanac (for March), then glued the image. 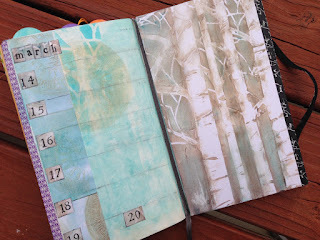 Next I edged the page with brown ink and added some quick swipes of white paint. I stamped the 3 and butterfly on pieces of torn mulberry paper and glued in place. 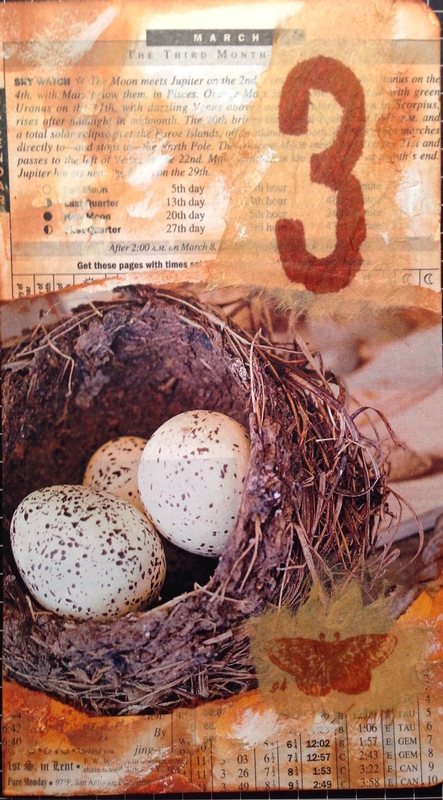 You'll notice that I themed my page around March, the number 3, third month, and 3 eggs. Give it a try! All you need is a glue stick and some magazine pages! I recently broke my wrist from a fall so haven't been able to do much of anything. I discovered I could snap open a jar of paint, squeeze some out, and then finger paint or use a brush -- all with my right hand! Perfect! Inspiration came from Flora Bowley and Alena Hennessy who introduced me to using a lot of layering when painting. This was originally an abandoned painted background that was dark and uninteresting. 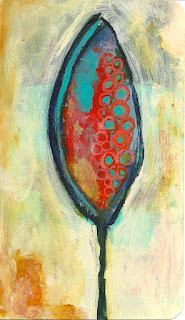 So I painted a pod - one of my favorite shapes - over top, then covered the background with buff paint. Allowing everything to dry before layering is key. I love how the colors underneath create a unique look. 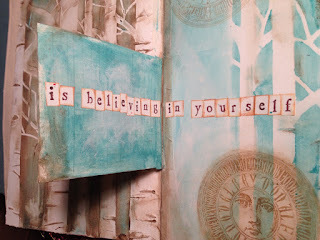 I believe in the healing power of art journaling, so decided to share a very personal example. JumpStart's challenge recently inspired me to study the work of artist Jean-Michel Basquiat who said, "I don't think about art when I'm creating, I think about life." Here's an inspiration from his graffiti-like style and my life experience. 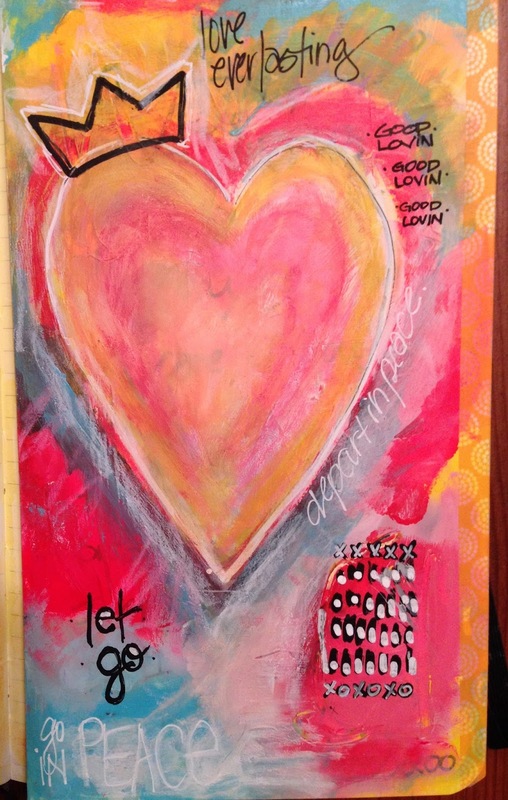 My dad lost his battle with heart disease yesterday, so I wrote a letter to him and covered it up with this art. The song by the Rascals "Asked my family doctor what's ailing me -- All you really need is Good Lovin'" came to mind for me. Here is what I expressed using paint, gesso, water-soluble crayons and Sharpie paint pens. Special thanks to Jodi Ohl for her interpretation of this challenge. I included "depart/go in peace" because he said that at the end of every church service. 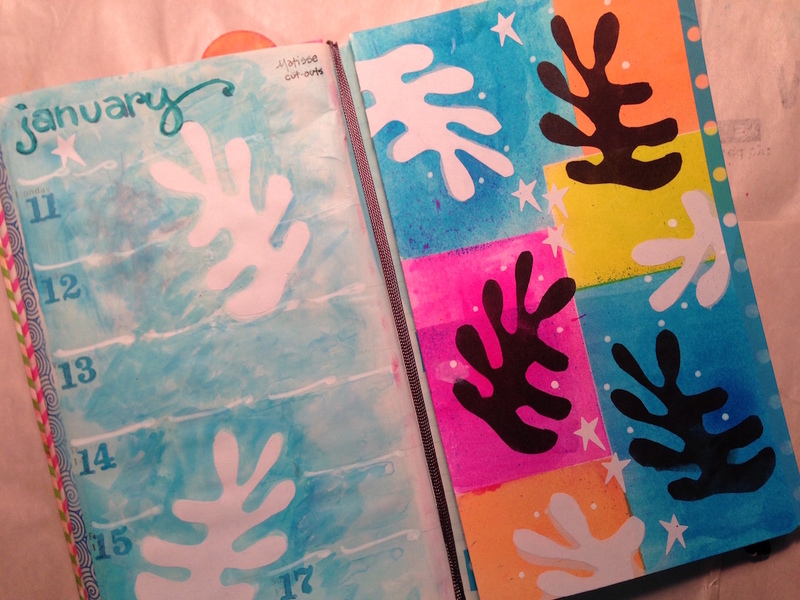 Following along with Creative JumpStart's Matisse inspiration, I tried some cut-outs for my weekly planner. This was really fun. 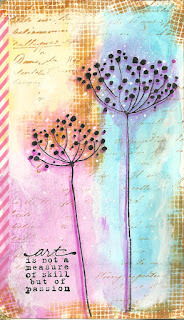 I will try Michelle Ward's file folder idea once I get some spray paint and acetate! So here I simply sprayed masked squares with Dylusions ink and then sponged black ink on a negative of the shape and adhered white cutouts of the positive shape. It was actually relaxing to cut shapes with a scissor! I did cheat on the stars by using a punch. With Natalie's Creative JumpStart 2016. The inspiration came from Matisse as Rae Missigman shared her jumpstart with us using layers and layers of paint. This is a different process for me, so I gave it a try! 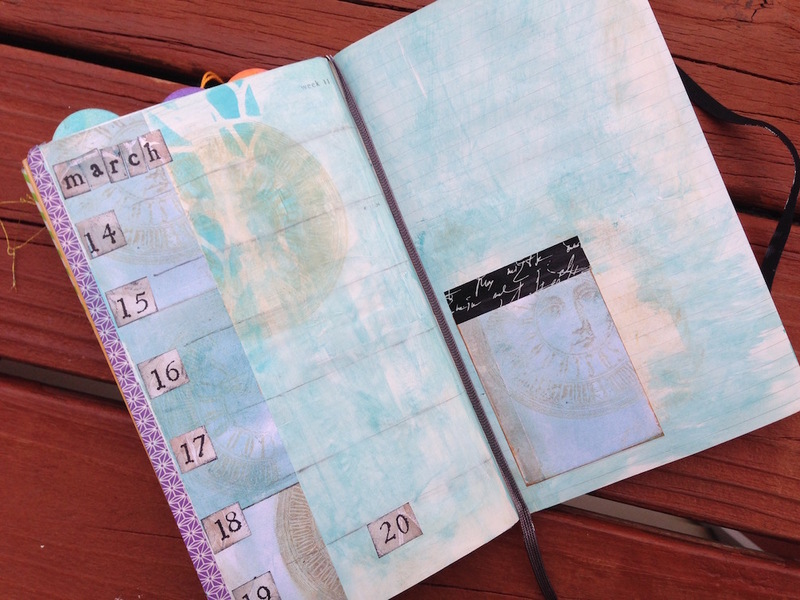 My favorite part was scraping away the white to reveal the colors underneath. Love learning the different, individual techniques used by all the JumpStarters!